A Moment of Really Living I grew up with an undying passion for soccer and in particular my team Crystal Palace FC, the club where I was born and raised in South London. This has everything to do with my father and my obsession seems to have become greater the older I have become. Fast forward 40 years and I have a son of my own, Julen, born and raised in Australia and now living in the United States. No reason at all that he should either like soccer or be a blossoming Crystal Palace FC fan. Fortunately for me he is both (which might have a sneaky bit to do with me). As his loyalty with the club increased, I realized I wanted to do something special for him that I never did at his age: be a match day mascot. Now of course when I was 11, being a mascot was not the experience it is today. So on the eve of the 2012/13 season I called the club to inquire about Julen becoming a mascot. I was told that as long as I wasn't looking for a game in the coming months, it would be no problem. So I chose a game towards the end of the season, mindful that I would need to organise a weekend and flights to London for the occasion. I waited for a special moment at one of our traditional family Sunday evening roast dinners to tell him. I wasn't even sure whether he knew what a mascot was but on sharing the news of our impending weekend, his face said it all as he broke out into a huge beaming smile. I'll never forget the moment. Fast forward a couple of months to our weekend together in London. I was intent on making it a weekend we'd never forget so on arrival in London, we spent the afternoon at the Natural History museum and then caught a sci-fi movie. The next day we did an open top bus tour of London, visited the Tower of London and finished the day with my brother and best friend at the theatre seeing Beatlemania. We spent so much quality 1:1 time together, just chatting about anything that came to mind. We saved the best for last of course. On Saturday April 13, we headed to Selhurst Park, South London, home of my beloved Eagles. We got there 3 hours before kick off to be greeted at the players' entrance and taken to the VIP lounge for lunch. Julen changed in to his full Palace gear and was shepherded away to meet the team in the dressing room (the only part I couldn't join!). 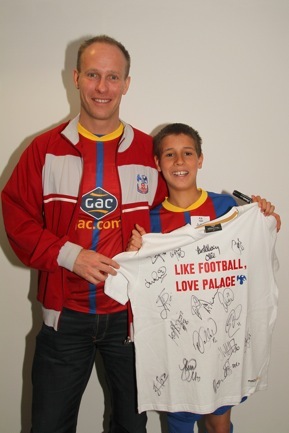 He returned beaming from ear to ear, with the white T shirt we had bought (that said "Love Palace, Love Football") signed by all the players and manager. I had also arranged for my Dad and my brother to join us on the day and they arrived as Julen disappeared back into the dressing room to prepare for the team's pre-match warm up on the pitch. I was allowed to go pitch side to take photos and much to my delight, I was even given permission to stand by the players' tunnel with my video camera as both teams entered the stadium. As Julen came out hand in hand with the club captain, I had tears in my eyes. It was a wonderful game that finished 2-2 and the icing on the cake was that Palace went on to the play off final that year, won the game and got promoted back to the Premier League. The stuff that dreams are made of. On our return to the US, I had his signed T shirt framed together with photos from the day and the ticket stub. It was a day that neither of us will ever forget and was truly a "moment of really living". This things here: they're a lie. I might look healthy, but according to my calculations, I don't have much time left - a couple of years at most and it is going fast. Don’t worry, this is not some “Last Lecture.” Or maybe it is, for all of us. We are all in the same boat: we are all dying and we all have less time than the calendar of chronological years suggests. If you are a reader of this blog, you probably already feel this. Chronologically I'm only half done, but experientially the story is different. Question: Do you feel that time is accelerating? That hours are growing shorter and that each year flies more quickly than the last? Time is the most valuable commodity we have as humans, and it is passing through our hands like so many grains of sand. I want do something about that: how can we manage the actual experience of time? Eating right and exercising helps a little but solves the wrong problem. In a exponentially accelerating scale, tacking on a few integers does not amount to much in the grand scheme of things, particularly when adding a few years seems to involve a life of asceticism. 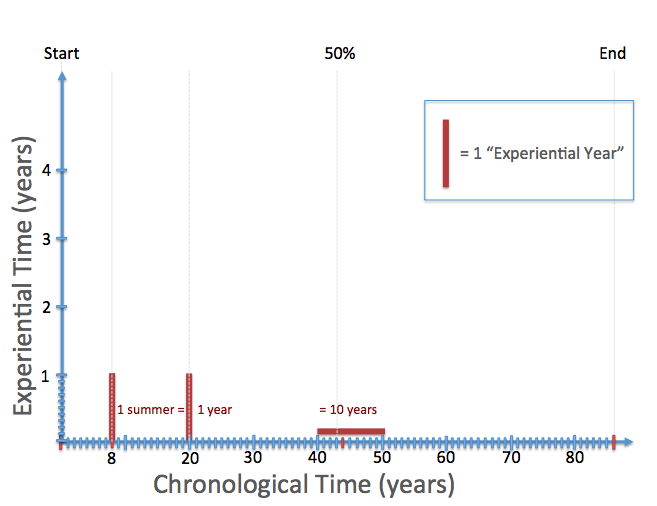 Consider another paradigm of time based on our actual experiences – “experiential time.” I have now asked nearly 100 people the following question, "Think back: when you were 8 years old, how long did summer last?" The answer, nearly ubiquitous, is, "forever." Let's scale back "forever" and instead assume that from an experiential standpoint a summer in youth, say, as an 8 year old, feels about the same as a whole year as a 20-something. And that same year as a 20-something starts to feel awfully similar to a decade in middle age. 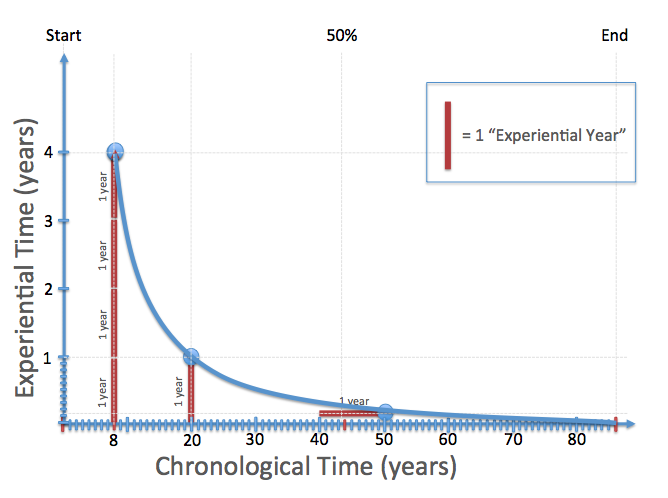 If you plot experiential time vs. chronological time, a frightening graph appears. 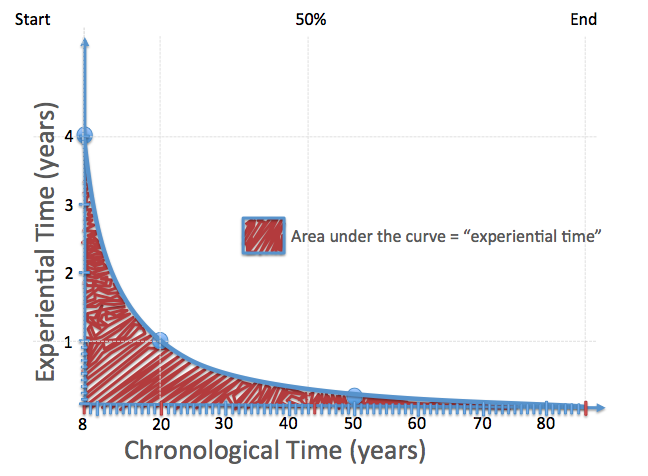 The area under the curve represents a simple measure of “life” and the math is not promising. 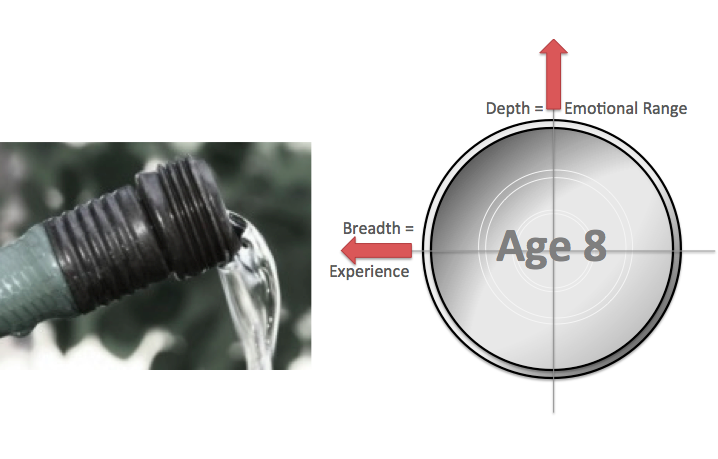 Here's a simple graph showing this decay in experiential time with markers at age 8, 20, and 50. We've been trying to measure the "area under the curve" with a yardstick of chronology - it doesn't' work and leads to huge errors in our math. It gets worse if you plot experiential time linearly keeping the area under the curve (life) constant. 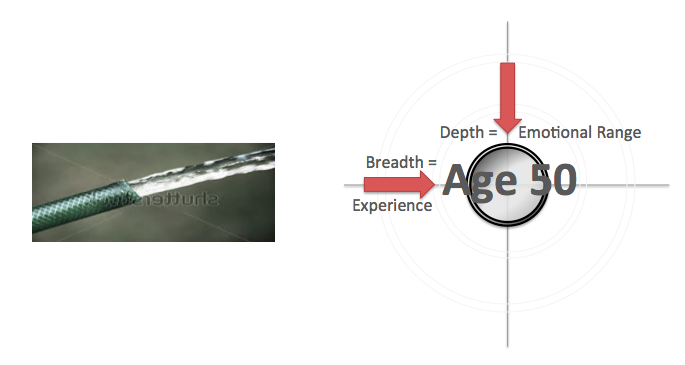 Since "experiential time" is merely the area under the curve, we must now take the integral of the equation or simply readjust the x axis according to the logarithmic scale we just shared to figure our "true age" or "life left." 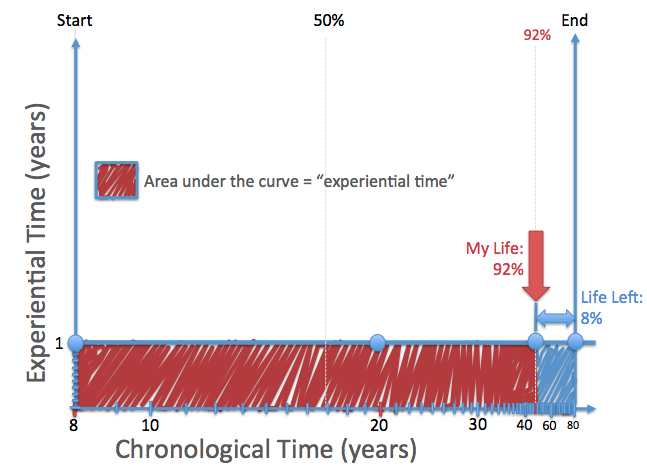 When you plot time as we experience it cognitively, a 44 year old with a life expectancy of 86 is not “half done” – rather from an experiential standpoint life is more than 92% over! All other factors being held constant, the conduit for the flow of time, as processed through the constraints of cognition, will contract, resulting in the subsequent perception of the acceleration of time. I'll admit it - this terrifies me. Is anyone else terrified? You should be. Life isn't just half over. We don't have 50 or 40 years in front of us to do all of those bucket list things - NO, life is in its final chords, the fat lady is singing, and we are, practically speaking, nearly dead. The good news, even great news, is that it doesn't have to be this way - if we accept that time is not linear, that the brain processes time according to a different set of rules, then we can accept the possibility that we can alter the perception of time as processed by the brain, and hence really live "longer." It is perhaps a cliched notion that "if you cannot add more years to your life, add more life to your years" but the reality of our experiences and the findings of modern neuroscience provide tools and ideas to make this happen. Let me introduce the first metaphor for the new physics of time - We've all heard time described as a "river" flowing infinitely forward, and infinitely backward - this is a good place to start. 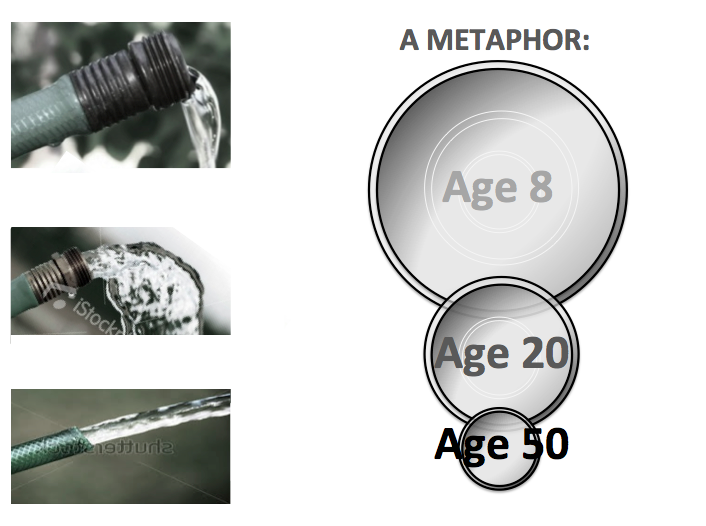 To improve the metaphor, consider our experiences with time as if the brain is a "garden hose" through which time flows. What happens when you constrict a fixed flow of water through a garden hose? According the physics principle of (V) = (Q)/(A) the velocity (V) of a flow is indirectly proportional to the cross sectional area of the conduit (A) assuming a fixed flow (Q). This, I believe, perfectly describes what is happening to most of us - we are creating lives that accidentally constrict the passageway for the flow of time and in so doing cause it to accelerate. Let me demonstrate through the life and times of an 8 year old and his or her garden hose or conduit for time. The two axes that determine the speed of water through a hose are width and height or, breadth and depth. 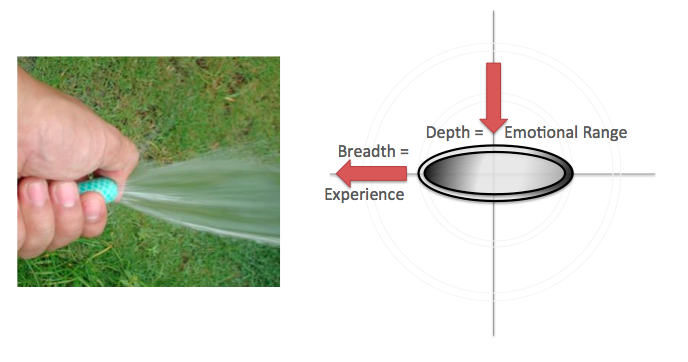 Specifically in this case, cross section of the hose is driven by the breadth and depth. 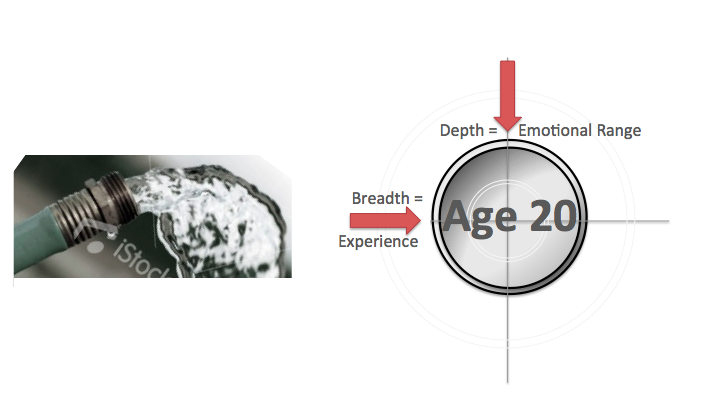 The breadth we are talking about is breadth of experience. For an 8 year old, the whole world is NEW. There is so much to find joy in, skipping rocks, running pel-mel into a lake or ocean, fireworks, sledding, it is all new. 8 year olds also have a "depth" of experience emotionally, not only do they experience the joy of love, of summer nights, and discovering new things, they also skin their knees, get hit by baseballs, find themselves alone or lost or both, get into fights and they cry. A lot. Now lets consider the experience of a 20 year old. Now they've declared a major and are honing in on their future career. They've experienced a lot, so new experiences, while still common are not an everyday thing like an 8 year old. They've also acquired a taste for comfort. They've learned to avoid those horrible experiences where they are picked last for the team, mocked for being odd, or rejected for their interests by aligning with a more homogeneous group of friends. Their hose, their conduit for time has narrowed. As their brain matures, their "set point" for the processing of time becomes fixed which is why I consider the set point for the notion of "1 year" fixed here at age 20, not at age 8. Fast forward and now consider the average middle aged office worker. Routine rules the day - same wake up time, same commute, same co-workers, same type of problems in the same department. Even when they go on vacation, they go to the same place. The middle aged professional also has the money to eliminate the pains and aches of life. The modern conveniences of air conditioning, heat, Advil, and TV, have created a platinum sweater around him or her. This muffling gauze of modernity necessarily constrains the highs as well as the lows, like wearing earplugs for the sometimes jarring music of life. This narrow existence and comfortable life further constricts the breadth and depth of the temporal conduit, and by middle age, time races by, flowing in an artificially pressurized valve, much like arteriosclerosis. The middle aged man or woman feels safe, they are comfortable.. And they are, as the saying goes, "killing time" as it flies by. The antidote here is quite simple - in order to expand the conduit of time and hence slow it down you have to increase the breadth and depth of your experiences - live more like an 8 year old, or as Hemingway writes, live life like a bullfighter. Now to some extent many adults sense this - they sense life is passing them by and so they intuitively seek out new opportunities to expand the breadth of their experience. They decide to take classes, learn a new language, pick up an instrument, resume singing lessons, take up a sport - and to some extent it works - these expand the breadth of experience. BUT, these experiences only expand their lives in one dimensionsand hence their hose of time is flat, there's no depth to those new experiences. Why? For the simple reason that there is no risk in those activities, no fear of failure. An unfortunate truth of life is that without risk of failure, without the possibility or actuality of suffering, then you cannot have depth. So, to conclude this first metaphor, in order to unconstrict the garden hose, you have to take on risk in those new experiences. If you take up piano, sign up for a recital, if you take up singing, perform on stage, if you take up running, enter a race. Also, when you go on vacation, never go to the same place twice. So, how to know if you are 'doing it right?" If something you are pursuing doesn't carry the risk of real tears upon failure, if it doesn't carry that kind of emotional commitment, then you aren't "living all the way up" and you will not be able to slow time to that of an 8 year old, or a bullfighter. But, if you expand your set of experiences, and allow the pendulum of emotions to re-enter your life, take chances, get emotionally vested, then you can widen your hose of life and slow time. That is really living. The experience of time in the present is often inversely proportional to the experience of time as remembered in the past (experiential time). 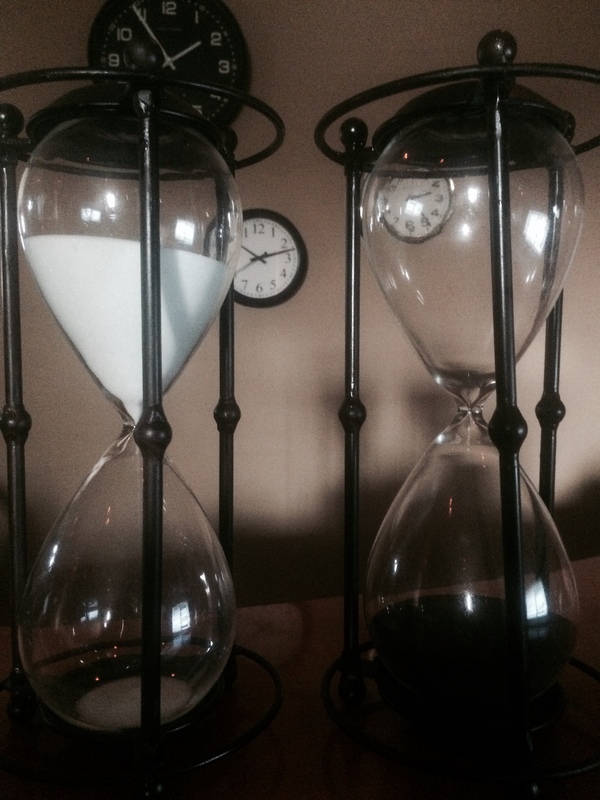 Remembered time governs the overall experience of time.